UPDATE: The Bellator 218 results have wrapped up. Emmanuel Sanchez emerged victorious in the main event. The time has arrived for Bellator 218. The card will take place tonight (March 22) inside the WinStar World Casino & Resort in Thackerville, OK. The main card will air live on Paramount Network and DAZN at 9 p.m. ET. This will be Bellator’s first event since Feb. 23. 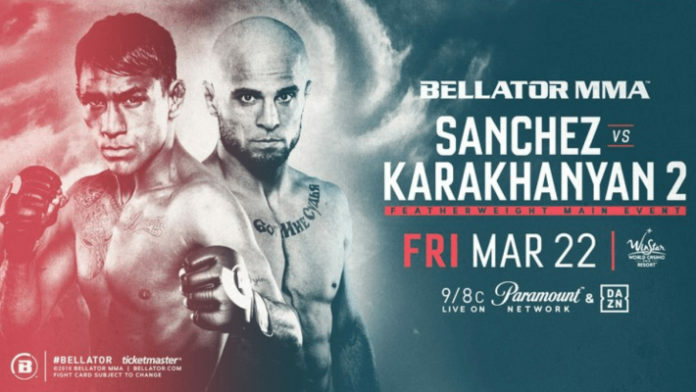 In the main event of Bellator 218, Emmanuel Sanchez will share the cage with Georgi Karakhanyan. The co-main event will see Valentin Moldavsky go one-on-one with Linton Vassell.